Luscious caramel tops a sweet-salty treat of peanuts, pretzels, marshmallow creme and peanut butter. 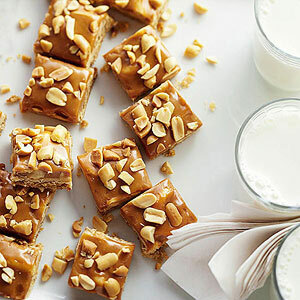 In a heavy large saucepan, combine unwrapped caramels and milk. Cook and stir over medium-low heat until melted and smooth. Pour caramel mixture evenly over peanut layer. Cool in pan on wire rack. Using the foil, lift the uncut bars out of the pan. Cut into bars. Makes 48 bars. Place bars in a single layer in an airtight container; cover. Store in the refrigerator for up to 1 week.